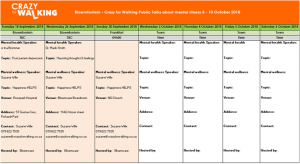 Public talks about mental illness will be hosted in Bloemfontein during 3 – 10 October 2018. Contact Suzane Wille suzane@crazyforwalking.co.za to request a presentation at your company/organization. Dr Mariki Smith (Psychologist) will do presentations about mental health on 9 & 10 October in Bloemfontein. Sr Ina Brummer is a Unit Manager at Bloemcare hospital. Contact Suzanne Wille if you would like Sr Ina Brummer to do a presentation about mental health at your company.